Custom propery drawers to ease fields value management in Unity editor. Import UnityForge namespace to be able to use attribute from the attributes list. Add attribute to string field to enable selection of animation name value from dropdown list in Unity editor. Attribute without parameters works on Animation component attached to inspected object. Specify animation component via animationField constructor parameter to enable animation name selection from that component. Unity manages clips internally specifically so for some reason order of clips returned by AnimationUtility.GetAnimationClips differs from the one displayed in the editor for Animation comoponent. Due to this expect different order of items in dropdown list for attribute. 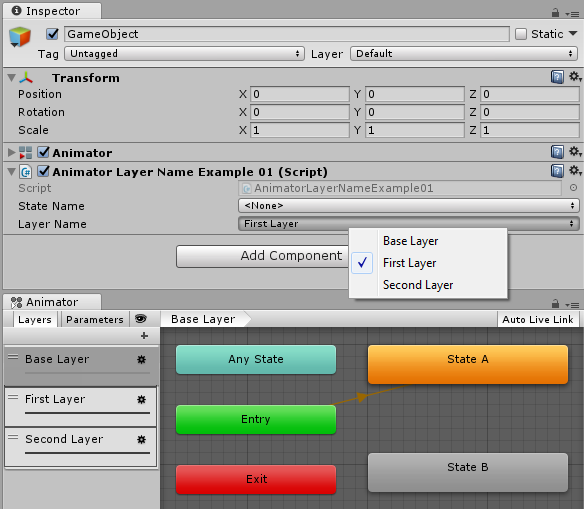 Add attribute to string field to enable selection of animator layer name value from dropdown list in Unity editor. Attribute without parameters works on Animator component attached to inspected object. Specify Animator component via animatorField constructor parameter to enable layer name selection from that Animator component. 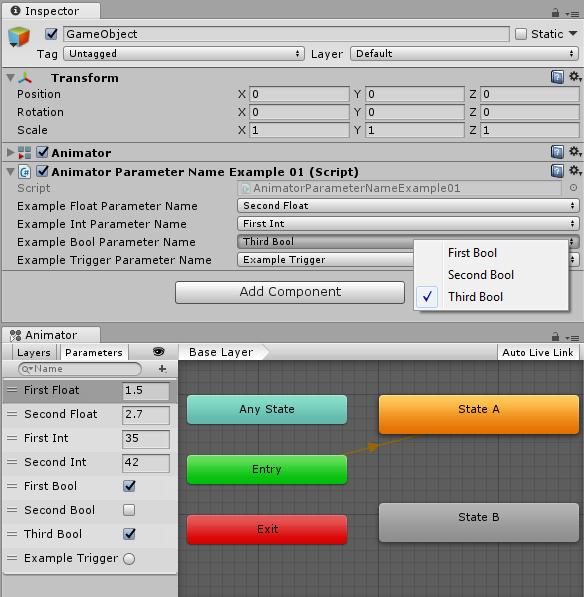 Add attribute to string field to enable selection of animator parameter name value from dropdown list in Unity editor. Note that parameter type must be specified for attribute. Attribute without other parameters works on Animator component attached to inspected object. Specify Animator component via animatorField constructor parameter to enable parameter name selection from that Animator component. 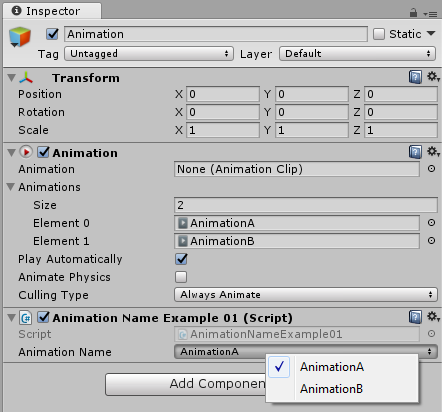 Add attribute to string field to enable selection of animator state name value from dropdown list in Unity editor. Attribute without parameters works on Animator component attached to inspected object. Specify Animator component via animatorField constructor parameter to enable state name selection from that Animator component. Since layer index is decoupled from animator state name in Unity API, state name alone does not determine state and state index value should be managed separately. If only one animation layer is used, it’s not the problem and Play(string stateName) overload can be used safely for fields using AnimatorStateName attribute. Add attribute to string field to enable show object field instead of text input for object path. Object selection updates serialized value of the string field. Attribute declataion requires object type. Attribute supports both full project path (like “Assets/Sprites/MySpriteA.png”) and resources path type (like “Sprites/MySpriteB” for full path value “Assets/Resources/Sprites/MySpriteB.png”). Additionnal option allows to preview path value which is serialized. 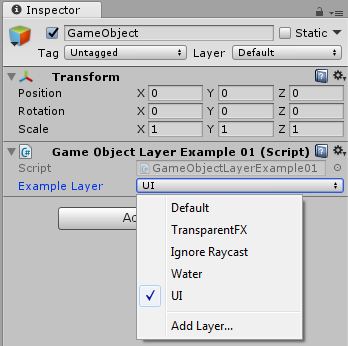 Add attribute to int field to enable selection of game object layer value from dropdown list in Unity editor. Layers are configured in Tags and Layers Manager. 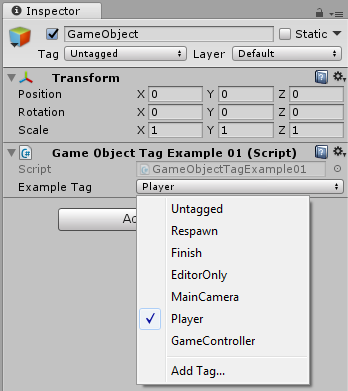 Add attribute to string field to enable selection of game object tag value from dropdown list in Unity editor. Tags are configured in Tags and Layers Manager. 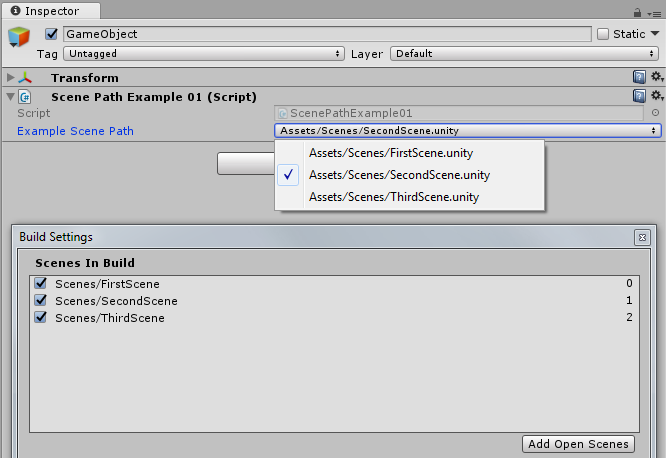 Add attribute to string field to enable selection of scene path value from dropdown list in Unity editor. Path type can be set via fullProjectPath argument: if true, scene path will be full project path like “Assets/Scenes/MyScene.unity”; if false, path will be short project path without “Assets/” and “.unity” extension like “Scenes/MyScene”. Source to populate dropdown can be set via fromBuildSettings argument: if true, only scenes from build settings will be shown in dropdown; if false, all scenes from project will be shown in dropdown. Additionally, onlyEnabled argument can be used to show only scenes enabled in build settings if fromBuildSettings is set to true. 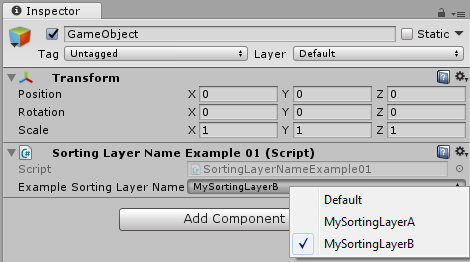 Add attribute to string field to enable selection of sorting layer name value from dropdown list in Unity editor. Sorting layers are configured in Tags and Layers Manager. 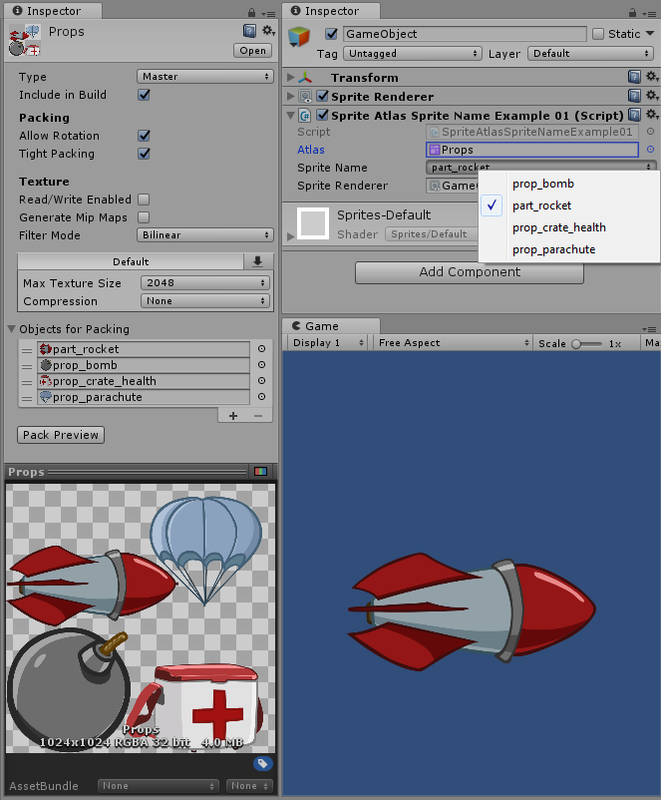 Add attribute to string field and specify sprite atlas field to enable selection of sprite name from that atlas via dropdown list in Unity editor.